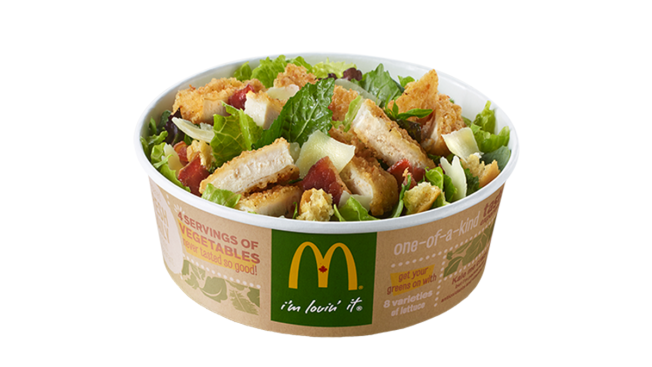 McDonald's website boasts the "Keep Calm, Caesar On" salad bowl as "a nutrient-rich lettuce blend with baby kale, delicately topped with delicious crispy bacon, real parmesan petals and roasted garlic focaccia croutons." McDonald’s has put a lot of marketing dollars behind revamping their image to become a “healthy” fast food option, but one of their newest “simple” and “fresh” options for clean-eaters will do more caloric damage than a Big Mac, according to the chain's nutrition information. The fast-food giant recently unveiled a new line of salad bowls that contain kale, a leafy “superfood” that has become a sensation for its nutritional value and being packed-full of vitamins. “A salad so delicious, it might be hard to stay calm,” McDonald’s website reads of the new menu item, the “Keep Calm, Caesar On” salad. But dieters might have a hard time keeping calm after finding their bowl of greens has more fat, calories, cholesterol and sodium than most of the other items on the entire menu. Swapping out the “crispy” chicken for grilled is an option, but will only save you 160 calories. The American Heart Association recommends eating just 2,000 milligrams of sodium and 1,200 to 1,500 calories per day. McDonald's does offer other salad options that are not as hard-hitting to the waistline. McDonald's Southwest Salad only contains 280 calories and 490 milligrams of sodium, CNBC points out, which includes a creamy southwest dressing. A side salad without dressing is only 15 calories and 10 milligrams of sodium. A spokesperson for McDonald’s did not immediately respond Friday to a request for comment.